Coach Mick Holt of Eight-Man, Division I Sedan is a fan of the Class 5A/6A playoff structure that started last fall. Instead of districts, the larger class teams have an eight-game regular season. Every squad is seeded for the playoffs based on several criteria, notably win-loss and point differential. In 2016, the maximum point differential for a single game was plus or minus 21, while this year it dropped to 13. Class 4A is expected to have the same model next year. Eight-man football remains in the district system with only the top-two teams in each district advancing to the playoffs. When teams are tied in win-loss, the main tiebreakers are head-to-head and the points margin capped at 21 points for a single game. Last fall, Sedan finished 8-1 but missed the playoffs out of District 1. St. Paul, West Elk and Sedan went 4-1 in district play. St. Paul was plus-74 margin in districts, while WE finished plus-63 and Sedan was plus-51. Sedan won at St. Paul, 50-40, in Week 9. West Elk and St. Paul captured playoff games and finished 9-2. Additionally, Sedan had another quality win when it beat Oxford, 62-28, in Week 3 in a non-district contest. Oxford captured nearby District 2 and went 7-3 with two losses to West Elk. Since 2008, just three teams have finished 8-1 and not made the playoffs. Sedan has done so twice. Atchison went 8-1 in Class 4A-I two years ago. Sedan finished 8-1 in 2011 in Eight-Man, Division I. Further back, Sabetha (3A) and Waverly (8M-I) each failed to reach the playoffs with an 8-1 mark in 2007, while Jayhawk-Linn finished 8-1 in 2004 and missed the 3A playoffs. Holt, in his eighth year with the Blue Devils, coached those Sedan squads. Earlier in his career, he had a Dexter team that went finished 8-1 and didn’t make the playoffs when just one team qualified out of each district. Sedan has not reached the postseason since ’09 when it finished 2-7 in Class 2-1A. Sedan’s predicament is similar to several eight-man teams. In addition to the Blue Devils, Pretty Prairie, Logan-Palco and Hoxie have been strong squads with no recent playoff appearances. Pretty Prairie and Logan-Palco are collectively 18-9 in the last three years. Sedan is 17-10, and Hoxie is 16-10. None of those teams have made the playoffs since at least ’13. Often, the eight-man balance of power is heavily tilted toward a few districts. In Division I East last year, Districts 1, 3 and 4 won 71, 71 and 66 percent of their non-district contests. District 2 captured 24 percent. The west side was more top-heavy, but Districts 5, 7 and 8 were all between 52 and 55 percent in non-district action. District 6 won 33 percent of its non-district contests. In Division II, 12 of the top-13 teams in the final Prep Power Index rankings came from just four districts. That included four in the top-12 in District 6. This season, most preseason polls have two, sometimes three teams from District 6 in their top-five for the class. The 21-point margin of victory hurt Sedan twice last season. In Week 5, Sedan beat Marmaton Valley, 40-20, for 20 points. Sedan had the chance to score late. Holt, aware his team was just short of 21 points, wished to not run up the score. After the game, Holt admitted to his assistant coach that he might have messed up. 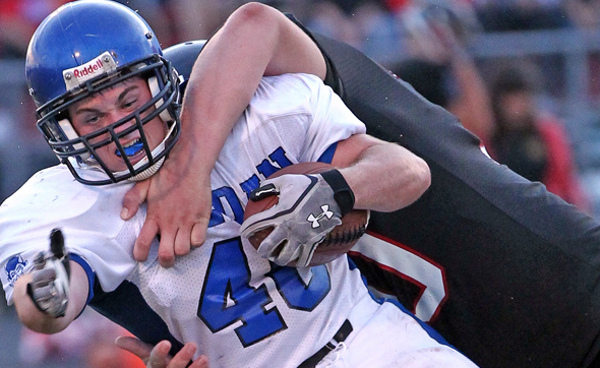 In Week 7, Sedan fell to West Elk, 46-24, a game that the Blue Devils committed six turnovers. The Blue Devils missed their best player, Hunter Padgett, because of a concussion. Starting quarterback Alex Burger hurt his shoulder the previous week and couldn’t throw. “The six turnovers against West Elk and losing by 22, that was what cost us, ultimately,” Holt said. After the loss, Holt admitted to his players he “made a mistake” not trying to score another TD late versus Marmaton Valley. “It could come back to haunt us,” he said. In Week 9, a healthier Sedan squad played its best game and controlled the contest in a 10-point road win versus St. Paul. This season, Holt believes Marmaton Valley and Madison to be improved district foes. Like ’16, he ultimately sees the season as likely coming down to West Elk and St. Paul, two games to decide Sedan’s playoff chances. “You have to beat them in order to get to the playoffs,” Holt said. Sedan has 14 players, the smallest roster under Holt, and five returning letterwinners. Sophomore Tayte Halderman will take over as quarterback for a team that graduated 96 percent of its rushing yards. Senior Dakota Halderman (58 tackles, team-high 16 TFLs) played nose guard last fall. He and seniors Kiefer Brewer and Isaac Campbell are returning starters on the line. Holt wants to keep Dakota Halderman up front because of his ability to control the ‘A’ gaps. However, Halderman has worked at linebacker because Sedan is limited there. Junior Cody Joslin has surprised after he didn’t play football the last two seasons. Joslin was a tight end in junior high. At summer camp at Southwestern College, Joslin played well, and Holt has switched him to running back. Joslin is the team’s fastest player and has started at defensive back in fall camp but could play some linebacker. “We were just a very physical team last year, and being able to stop the run was key,” Holt said. Hoxie, on a streak of seven straight winning seasons, went 6-3 last fall and returned every player. Senior running back Troyal Burris (817 rushing yards, 14 rushing scores, both team-highs) had no contact in the first two weeks because of injury. Around midseason track, Burris hurt his back. Burris eventually took the entire summer off. With Burris limited, senior Latham Schwarz (647 rushing, 13 scores) will receive more time. Oakley transfer Chris Cox, a standout lineman and wrestler for the Plainsmen, has worked in the backfield in Burris’ absence. Cox transferred to Hoxie shortly after wrestling season ended. He practiced with the track team and was eligible for regionals. The 5-foot-10, 233-pound Cox has helped 6-foot-5, 335-pound junior Taye Washington, a returning starter on the lines. Hoxie’s offensive line has remained the same, and Cox has worked at nose guard and defensive end for a solid defensive unit. In the last three years, Hoxie has collectively permitted just 16.9 points per contest, sixth-best in all of eight-man football. Hoxie has 25 players out, the most in Baar’s eight years. Hoxie has arguably its three biggest games in Weeks 3-5 with its non-district rivalry at Wallace County followed by District 8 games versus Atwood and at St. Francis. Baar labeled St. Francis “probably the leader in our district” after the Indians have back-to-back double-digit winning seasons. “We definitely got to win at least one of those district games to keep our playoff hopes alive,” Baar said. Last season, Osborne coach Cullen Riner returned to the Bulldog sideline, led a nine-win improvement to a 13-0 record and Division I title. Riner built the Bulldog program, moved to assistant and then took ’15 off before he came back to coach. Kevin Ayers has followed a similar path at Sharon Springs-Wallace County. Ayers, with three state titles in his career, including the ’07 crown with Wallace County, built the Wildcat powerhouse. He coached the Wildcats from ’06-13 and stepped aside to spend more time with his family after a runner-up finish. Assistant Jeff Hennick, the quarterback of the ’07 team, moved up to head coach and served three years, all sub-state runner-up showings. After two years away, Ayers came back as an assistant in ’16. Hennick took the Oakley job in May. “Maybe the Good Lord opening a door,” Ayers said. Following Hennick’s departure, Ayers, whose daughters are now in tenth and third grade, returned to teaching and coaching. Ayers is leading strength and conditioning and elementary P.E., virtually the same role he had before leaving to farm. He is 152-27 overall. Wallace County, in the playoffs every year since ’06, again opens in the top-five in Division II.